Tony Roma’s menu prices at your fingertips. Tony Roma’s is a full-service casual dining restaurant specializing in BBQ ribs. The Tony Roma’s menu also includes an extensive list of prime steaks, seafood entrées, one-of-kind appetizers, and mini desserts. A family-friendly atmosphere makes Tony Roma’s an ideal location for parents and kids. Parents can choose from a kid-friendly menu. Below are the latest Tony Roma’s menu prices. Fans of Tony Roma’s can sign up to receive the newsletter. The newsletter includes special offers, information on new menu items, details on upcoming local events, promotions, and valuable cooking tips. Sign up is on the Tony Roma’s website and is free. Tony Roma’s now makes it easier to enjoy their signature ribs and BBQ at home. Pre-cooked, ready to eat favorites can be found in the refrigerated section of local grocery stores. Available selections include ribs, pulled pork, or pulled chicken. The first Tony Roma’s location was opened in 1972 in North Miami, Florida by Tony Roma. In 1976, Tony Roma partnered with Clint Murchison, Jr. to expand the restaurant. Tony Roma’s first international location was opened in 1979 in Japan. Today, there are over 150 locations on 6 continents. Tony Roma’s is a privately held company headquartered in Plano, TX. 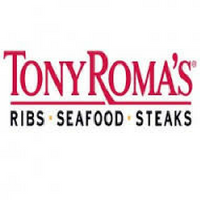 For more information about Tony Roma’s, visit their official website. Does Tony Roma’s take reservations? Yes, Tony Roma’s does accept reservations. Reservations can be made by calling the nearest location or by visiting the Tony Roma’s website and completing reservations online via a third party provider. Does Tony Roma have private dining capabilities? Most Tony Roma’s locations have a private room for special occasions or business meeting. Guests interested in reserving a private room need to contact their nearest location to get more details or visit the Tony Roma’s website. Does Tony Roma’s offer delivery service? Delivery service will be dependent on each location. Guests need to contact their nearest location to find out if delivery service is available. I am writing to let you know that I had gotten food poison from your Spicy Shrimp on the 8th of September at the New Jersey Airport. Since I had to caught my plane I could not go back and tell them that your Shrimp was bad. Do you check your Shrimp daily if not you should. I hope you will do something on this matter and make this right since I spend a lot of money on that meal. Thank you for any help you can give me on this matter up front.